Yep, their experiences are all pretty much what I worked out too. Except that I used Suzuki discs and aluminium spacers inside of them against the hub to centre the pads and the discs. Also, I gained an additional 7mm per disc in diameter, the brake pads sweeping close to the edge of the disc's surfaces, and the discs hard against the inside of the calipers to almost touch the two 10mm caliper through-bolts. It was worth the trouble. just studying the pics of your exhaust mount , it looks really tight in there between the tyre sidewall & the side of the exhaust , just wondering how much room you had with the standard rear rim , looking at mine ( I've got a Staintune ) I have about 40 - 45 mm of space , that Motad must be a pretty fat little sucker ! , hope the experiment is still working for you . In my case I went from a 140/80VB17 to the 160/60ZR18. There's barely 6 -7 mm on the left and the same on the right hand side, but as it's said "Close enough for government work", and that's all the tyre and exhaust need before they become intimate. The construction of the Motad might be the reason it's so close on the left hand side. The right hand side is the same clearance as stock, so the 'new' rear wheel has an offset. 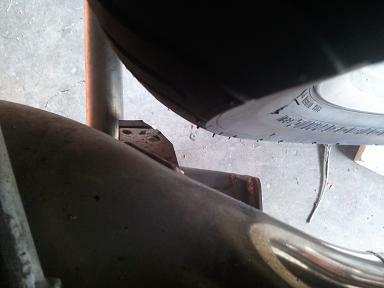 A K100 centre stand comes up between the tyre and the exhaust on the left to the rubber stop. A later K1100 centre stand does not. This allows the tyre to take up that space. I didn't check the clearance on a stock or 'other' brand exhaust but did begin to suggest measuring that clearance to Charlie this weekend on our ride. Dunno if we got there with the banter going on. i think i noticed that the angle of the front part of the staintune seemed to kink out slightly more from the collectors ...but ill put a measuring stick across there as soon as i can ...i guess the drive shaft side is a good reference huh ? The overall 'allowable' space you have back there is a good number to measure and record, but also the current space from the left edge of your tyre to the exhaust - and note that Staintune exhaust to stand bracket for potential interference. I reckon the right hand side swingarm space will not change much. right hand side is small finger width ...9 mm ? me maths horrible that it is, says it should fit ok .
could be on the trail of a 4.5x18 rear , you mentioned they are common on many models ie K1 , K100RS 16V , R1100RS , is it safe to assume it will be fine ? , or better still can you give me the part number of yours that we know fits ? The part number will vary depending upon the colour of the wheel. Suffice to say that the 4.5 x 18" rear wheel from the aforementioned wheels are all the same fit. There will be this 'n' that to deal with, depending on exhaust (aftermarket or OEM) and your patience with it all. It is not exactly a simple bolt on/ride away proposition. 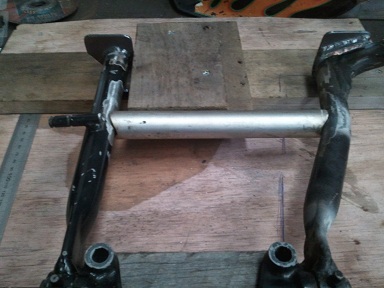 Last night, for example, I put a standard length, aftermarket rear shock on after removing a Works Performance 19mm shorter version and lo and behold the clearance on the left went away when the bike was placed on the centre stand. Do the maths on it and it becomes clear; the wheel is pushed further down in the travel. It's fine when the bike is on its spring and rolling along. I also had to use a K1100 centre stand and even that requires adjustment, albeit, minor mods. If you've the time ride up from Melbourne to the Araluen Hotel Saturday night and have a squiz. My bike and myself will be there. There'll be some kicking of tyres and telling of lies, I'm sure. But you can see the truth for yourself. i have news ...ive snagged one !!! ...its boxed, paid for and hopefully leaving soon ....yippee !!! with many great thanks to emlyn in blighty !...cheers to you !!!!! Yes! That deserves a frothy one. I've secured myself a second hand rear wheel now comes the centre stand , had a look at motobins & they show 2 stands , the 1st one ( part no 91509 ) has a description of "improved K stand" K100RS 16V suitable for 1986 on , 2nd says K upgrade kit 1986 on , all fittings req ( part no 91509K ) the pics supplied look the same , do you guys know which is the correct one to get ? Both is the same stand, 91509K is a kit with bushings and clips included. Since later one is the cheapest, it should be a easy choice. 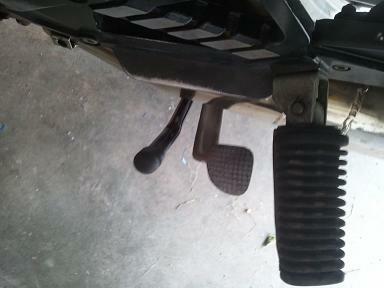 Take note that you will be doing some minor mods to the centre stand's left foot and to the foot lift lever since the left foot hits the edge of the wider tyre on a K100. I fabbed a piece of Kevlar and riveted it to the foot lift lever so that it 'stands' the foot away from the tyre the thickness of the Kevlar. It is a temporary solution to a problem. It loosened slightly due to vibes and heat during the three thousand plus kilometers to Araluen and back. I will probably use a tapered head 5mm screw and Nyloc nut and counter-sink it into the Kevlar so that only Kevlar is touching the exhaust and not the rivet or screw head. I reckon your results will vary depending upon what exhaust you're using. Mine is a Motad and very thick near this area. Also, the right hand foot touches down under load (with pillion and gear) on tight right handers. It's not a worry when riding solo. I'll take happy snap that shows what I did when I improve upon it. That's there yellow's a flash K1 wheel colour! Just wait 'til you go round a tight bend with a nice, big, wide black hoop of radial rubber under your hind end. You go, boy! tyres wont be happening this week ....drat !!! the trip south has emptied the coffurs ...but i could see the centre stand dissapearing real soon ...till a good (cheep) k1100 one comes around ....or the "their holyness", masters at work send me off somewhere remote again . mt isa is on the list ...and i need to get in and out before summer really starts ....phew a warm one today . ima thinking i might keep the same colour scheme that i have already started ..black spokes with silver rim ......what do you guys think ? The bike was originally 'Perlmutt', which is Mother of Pearl or Motorsport pearl white. The P.O. resprayed it a BMW catalogue colour, metallic red, after an unplanned get-off. I don't have the colour code, but it's quite red. TWB yep thought it looked richer, I wonder if Charlie will stay Yellow or go Black with his back wheel. called in to see mick at goodna .....he recons he'll fit up a tyre for under $190.00 and their in stock ...pirelli of corse ...he seems to think the balence of the current "demon" on the front and the new rear should be good . now still pondering the colour scheme .....i think black but i will add some silver to the outer edge into about an inch ...just inside the 3 spoke line ......i think it will lighten the look just a little ...thoughts ??? time for an update please , when are you going to fit up Charlie ? , I want to see how she turns out ! i would love to have it on jr ...still fighting with widening the centre stand a little ...gih has his going ok but the stand sits a little low !!!?? 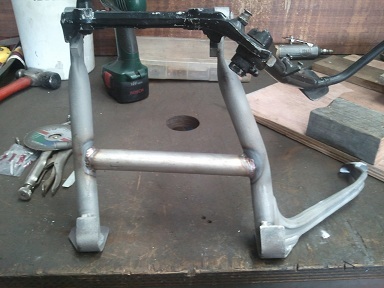 Charlie - what about slotting the base frame of the stand to allow more movement across. I'm using the K11 stands and wheel/tyre mod as is with my K100. Chazza is correct that it sits a little low but has only ever touched down on the right hand side when hitting a dip in a tight right hander whilst loaded with pillion, packed panniers and a 19mm shorter shockie. I've got a proper length Italian-made Bitubo on now, which is much firmer, with no dramas. Part of the clearance issue is with the 'arc' of the K11 sidestand in that it comes to rest in the retracted position against the fatter Motad muffler too soon. Shortly an exhaust modification I'm planning will take the stand's stopping location into consideration. Let's see how we go then. These are really minor issues with my bike, the minimal clearance a trade off for having a really decent set of radial rubber on the road. I think the variety of exhaust (aftermarket) we use make it more complicated. OZ for "she'll be golden"! Pics when I get internet access and don't have to use my Android phone, tiny bloody thing. Ok so here are some pics of Charlies centre stand undergoing modification. 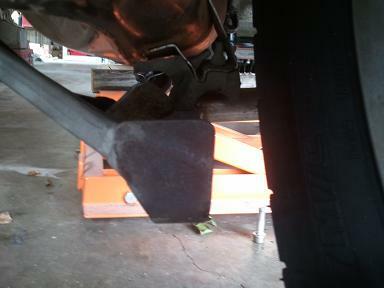 Here it is with new feet welded on and the new brace ready to be welded tomorrow. 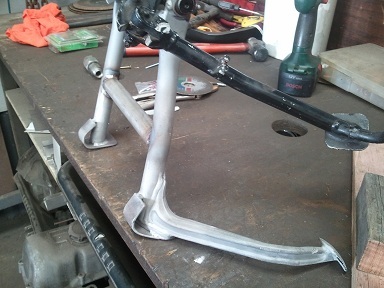 Sandblasted the legs before rewelding,will paint it after testing. Once its on i think Charlie and i are gunna adjust the keeper on the muffler. just a quick question for Ghost , just how much clearance do you have right now with your centre stand and the original mod ( 10mm shaved off foot ) to the tyre edge ( it's just that Charlie's mod will be beyond my resources ) & if I combine that with perhaps taking out the 2mm wheel spacer ? If you take out the 2mm spacer - and are using a 160mm tyre on a 4.5" wide rim - it will touch on the right hand side, and that's more likely depending upon what brand/model of tyre you use. And on the left hand side Ghost ? Thanks for posting progress on this guys! not a bad idea , I'll see how I go when I do a test fit up with the 18x4.5 rear that I have found , if it's only a few mm's I should be able to find that much room with a bit of carefull grinding here & there . I have seen GTIH's in the flesh and it does look the goods. Now the hunt for the appropriate sized rims for some nice radials. Ok here are some more pics. I test fitted it to my bike on saturday to check for problems. Seems ok. Here it is finished, i put in front of my k100 stand.Comes up he same width after being modified. Here is a pic from above the muffler. 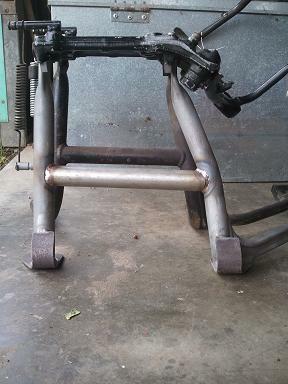 The centre stand arm hangs out the same as the sidestand even after being widened. And from underneath. 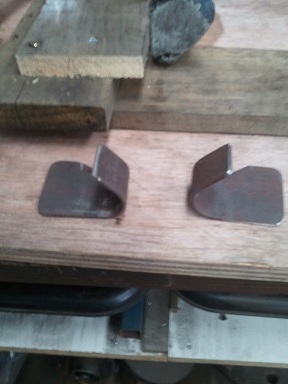 Just have to modify the rubber keeper to let the stand sit up a bit more. 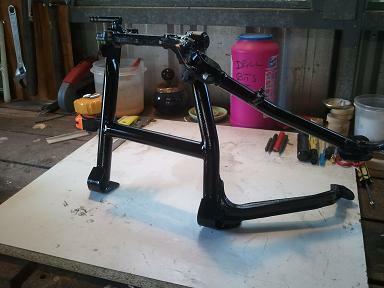 All painted pretty ready to fit to Charlies bike. Is there any issue with the extreme offset of one leg relative to the other leg? I'm wondering if the offset will introduce imbalanced loading on the legs and put undue stress on one. 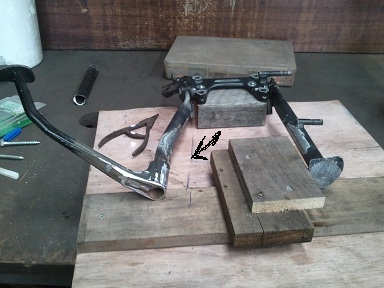 I wonder also if setting the bike on the stand will be easy as when the legs are symmetrical. Maybe not a problem; after all the bike only weighs 250kg. just to clarify ...maybe this will help . Sweet! I'm looking forward to seeing her with the new wheels Chaz. have you got bushes between the 'floorplate' of the stand and the gearbox? How high are they?? 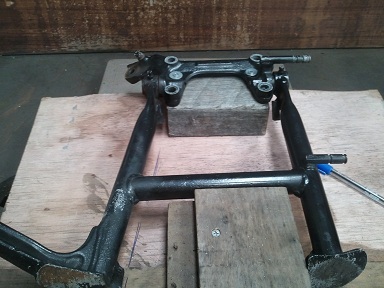 rene ...no mate its all standard ...the gearbox to c/stand bracketing is just bolted up . but heres an idea ... what about making a plate of , i dont know maybe 8mm thick aluminium with holes drilled exactly the same as the mount and use it as a spacer plate ? this might work better than trying to fiddle with individual ones under the plate and each bolt .! K11LT have spacers and longer bolts, as it have taller wheels than the K11RS. Charlie....both wheels on the ground......due to a longer shock. better feed those little grey cells with some more alcahol, im starting to make sence . @charlie99 wrote: better feed those little grey cells with some more alcahol, im starting to make sence . Hey.......it`s weekend........soon all things would make sence.